Item173 - Guildford 17C. 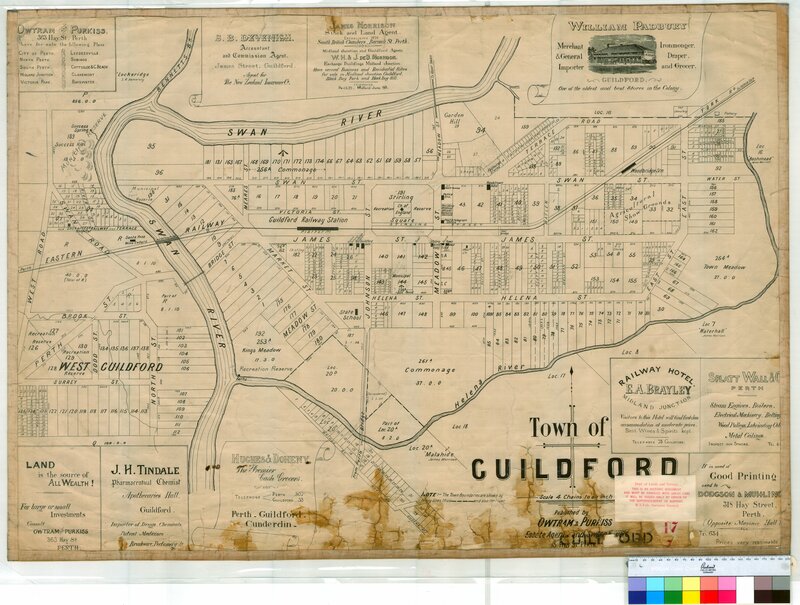 Plan of the townsite of Guildford. Philip Chauncy [scale: 4 chains to an inch, Tally No. 005709]. Item174 - Guildford 17D. Guildford - New street through Lot Nos 38, 39 & 8. 132 and 133 of the town of Guildford surveyed at the request of the Town Trust by Surveyor Ley, 16 VI 70. [scale: 3 chains to an inch]. Item175 - Guildford 17F. Plan of boundaries proposed for the townsite of Guildford in Western Australia, 7 March 1836. A Hillman, Colonial Draftsman [Tally No. 005711]. Item176 - Guildford 17/1. Guildford - Lots between Helena River and Swan River, and Lots west of Swan River to West Road [scale: 4 chains to an inch, Tally No. 005712]. Item177 - Guildford 17/7A. Town of Guildford. Published by Owtram & Purkiss, Estate Agents and Sworn Valuers, 363 Hay Street, Perth. Compiled and lithographed by C. M. Purkiss 10/08/1902 [scale: 4 chains to an inch]. Item178 - Guildford 17/7B. As with 17/7A but in addition this lithograph was registered with the District Survey Office and a number of the lots have been annotated [Tally No. 005714]. Item179 - Hamel 182. Hamel townsite and agricultural area. Includes South Western Railway and reference of trees. Harold Gladstones. [scale: 6 chains to an inch]. Item180 - Hopetoun 214. Townsite of Hopetoun, includes railway. George Reilly [scale: 3 chains to an inch]. Item181 - Kalamunda 222. Town lots Calamunda, includes Upper Darling Range railway. E. A. Absolon [scale: 4 chains to an inch]. Item 177 - Guildford 17/7A. Town of Guildford. Published by Owtram & Purkiss, Estate Agents and Sworn Valuers, 363 Hay Street, Perth. Compiled and lithographed by C. M. Purkiss 10/08/1902 [scale: 4 chains to an inch]. Guildford 17/7A. Town of Guildford. Published by Owtram & Purkiss, Estate Agents and Sworn Valuers, 363 Hay Street, Perth. Compiled and lithographed by C. M. Purkiss 10/08/1902 [scale: 4 chains to an inch]. Confirm Item Request: Guildford 17/7A. Town of Guildford. Published by Owtram & Purkiss, Estate Agents and Sworn Valuers, 363 Hay Street, Perth. Compiled and lithographed by C. M. Purkiss 10/08/1902 [scale: 4 chains to an inch].